The Mighty Samson® Hammer Mills are highly durable utility grinders capable of dry grinding most free-flowing materials. Hammer mills operate on the principle that most materials will grind or crush upon impact with the hammers. Feed Material passes through the feed hopper of the Hammer Mill into the grinding chamber. The material is crushed or shattered by the repeated hammer impacts, collisions with the walls of the grinding chamber, as well as particle on particle impacts. The swinging hammers, in the rotating hammer rotor, crush materials against the stationery liners before driving them through a screen. The combination of different hammer styles, liner plates and wear resistance technology offer almost unlimited possibilities of crushing lumpy, bulky, irregularly shaped, hard and fibrous materials, into coarse to medium fine powder. In the Mighty Samson® Hammer Mill, the perfectly balanced extra heavy all steel rotor with extended hammers grinds fed materials which are then push through a screen to a desired size. When the materials get into the working area of hammers, the rotating hammers crush the material with a tip speed of 270 miles per hour with 3600 RPM direct coupled motor or with a belt drive for different speeds. The material continues to be crushed until it can pass though the screen for a desired particle size. Special alloy steel shaft on FAFNIR ball bearings, complete with sight cups oil level fittings. 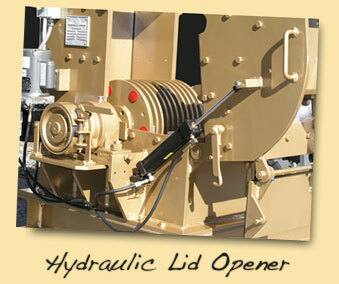 Made with exclusive one-hand lift-type lid opening latch - opens in seconds - No Bolts, No Tools, No Lost Time. Exclusive spring balancing mechanism ... cushions the lid and to keep it from opening too far. This feature eliminates all chance of injury to the operator because of accidental lid-dropping. It can't! Free-fitting hammer pins are removed in seconds - another time-saving feature. Perfectly balanced extra heavy steel rotor in our Hammer mill - 26" diameter with hammers extended - gives the Mighty Samson greater hammer tip speed of 270 miles per hour with 3600 RPM direct coupled motor. The Mighty Samson Hammer® Mill's can acheive different RPM performance by merely changing the sheaves and belts. Fast! Easy! The direct drive mill motor can be mounted on either side to fit your installation requirements. The feed opening is flanged to permit permanent feed chute that can be bolted or welded to the chute opening.